Supreme Task International is a missionary organization that works within northern India. STI wants a web site that will help them communicate with their support and donor base. 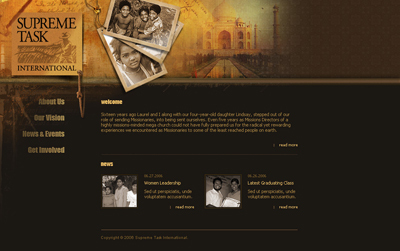 Create a dynamic web site with News, photos, blogs, etc and give it a design that looks much like India. The client wants to have a dynamic web site with constantly changing information. He has news, photos, and blogs that need to be updated on a weekly basis. The web site will need to accurately portray the work they are doing in India while also giving the visitor access to things such as demographic statistics, etc. STI will need a management panel where they can update the information themselves. XI developed a ColdFusion and MySQL relational database solution to store the needed information and allow it to be manipulated from an administration panel. The design is beautiful and has random photography from India in the flash banner. The database solution delivers the needed information all across the web site.